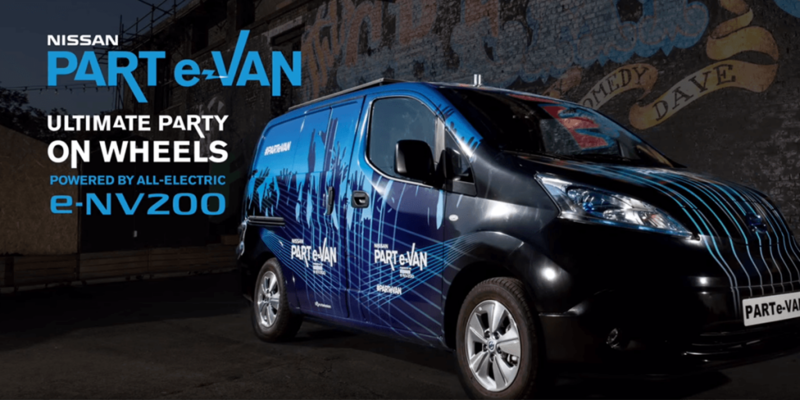 The world’s only augmented reality electric Part-E van – The ultimate party on wheels. Nissans agency, L3 came to us needing ideas for an electric van which was to be interactive, fun, social and ready for the big launch – in just 5 weeks’ time. The vehicle, called the PART e-VAN was going to be powered by the 100% electric Nissan e-NV200 and feature a DJ booth, disco ball, cocktail maker, LED dance floor, fridge, a six meter light-up canopy and two large screens on either side. This is where we came into play. We wanted to use these screens to create an interactive augmented reality feature that would be equally as futuristic and memorable as the van itself. We created a AR ‘photo booth’ style set up where party go-ers could take photos in front of the screens with their friends, and as if by magic, appear against a range of enticing and exciting backdrops. Plus, we added a feature to allow users to create interesting visual effects and sparkles using their hand gestures (because everyone loves sparkles) to create some memorable and fun photo effects. Users loved the simplicity and fun use of the screens – plus, users could get their photos sent straight to their phones just by tweeting a unique hash code. Clever! For us, this project was a great example of the studio pulling together in a short burst project and delivering a great solution. Plus, we got to go to the Champions League and Le Mans to do the hand over!